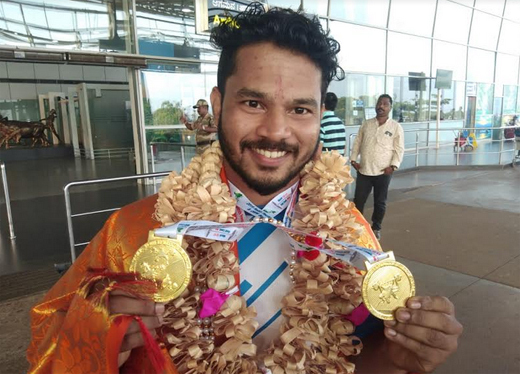 Mangaluru, Mar 19, 2019: City’s most talented power lifter Pradeep Kumar Acharya who won two gold at the Asia Pacific Equipped Power lifting Championship 2019 held at Gold Coast, Australia, was accorded a warm welcome at the Mangaluru International Airport on March 19, Tuesday. Acharya’s parents were present at the airport along with former MLC Capt Ganesh Karnik. Acharya was also adjudged the Second Best Lifter at the Championship. He lifted an overall weight of 652.5 kgs including 252.5 kg in Squat, 190 kg in Bench Press and 250 Kg in Deadlift. He participated in the 74 kg category. The event was held from March 12 to 17. He is now poised to take part in the World Championship to be held at Dubai in November. Pradeep Kumar Acharya who is a member of Balanjaneya Gymnasium is coached by Satish Kumar Kudroli.